As part of the Heritage Lottery-funded ‘Living Wild at Kielder’ project, Kielder Water & Forest Park now offers exciting “Wild at Kielder” high-tech treasure hunting for all the family to enjoy right through the year. Just because summer is over it doesn’t mean we have to stay indoors. Kielder is at its most beautiful at this time of year and the Wild at Kielder geocaches hidden around the Park’s lovely “Wilder Walk” route allow you to enjoy fabulous scenery, learn more about wildlife and discover hidden treasure. It won’t cost you a thing and you’ll gain tons of fresh air and a new zest for exploration! So, wrap up warm this autumn, grab a smart phone or GPS system, sign up free to www.geocaching.com, head to Kielder and start searching. Geocaching is increasingly popular worldwide and there are an estimated 1.4 million caches across the globe. It’s a real-world, outdoor treasure hunting game, played using GPS-enabled devices. Participants navigate to a specific set of GPS co-ordinates, downloaded from the website or app, and then hunt for the geocache container hidden at the location. These “caches” - often airtight containers – usually contain a logbook for hunters to record names and dates of the find (which should be logged online and added to your record) – as well as trinkets and souvenirs. If the finder decides to take anything away, they're required to leave something of equal or greater value for the next person to discover - and the chain begins! So far at Kielder, there are four geocaches in place between Kielder Castle and Bakethin Nature Reserve. Another is to be placed near Bakethin Nature Reserve and a further cache will be hidden at Tower Knowe peninsula next year. Two “trackable” creatures, a red squirrel and a salmon, have started journeys from the Kielder geocaches, with instructions for players on how they can help them achieve their goals of moving around the forest and migrating along the River Tyne. It’s a great family activity for all ages and gets everyone out into the open air with a shared mission and sense of excitement. All of the spots have been selected by members of the Forestry Commission and Environment Agency teams, who chose some of their favourite sites on particularly special locations in the woods. Phone reception isn’t necessary as people take part by turning on the ‘location’ function on their device, turning it into a GPS receiver. 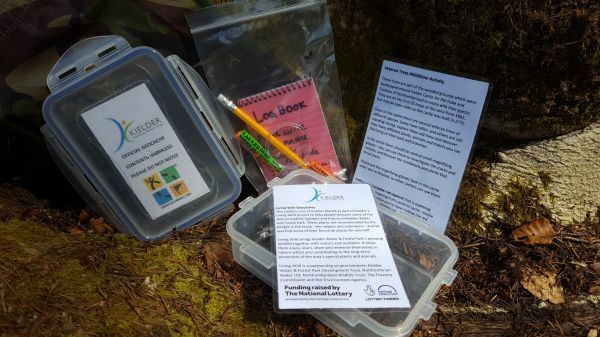 Lynn Turner, Director of the Kielder Water & Forest Park Development Trust, said: “Geocaching is a great way to integrate technology with the natural world and really get people of all ages excited about exploring and logging their discoveries. To find out more, sign up to www.geocaching.com and find caches and trackables placed by Visit Kielder.